The vast majority of transition metal compounds feature a positively charged metal ion bound to neutral or negatively charged electron donor compounds. In these complexes the metals act as electron acceptors (electrophiles). In this regard, gold is unique, being the only transition metal to give rise to a negatively charged 'naked' ion, auride, in solution or solid state. Therefore, in principle, gold can also act as an electron donor (nucleophile). However, the first example of nucleophilic reactivity by molecular gold system in solution has been reported only now. The synthesised linear two-coordinate compound showcases an aluminium-gold bond which is highly polarised towards gold as expected based on the much greater ability of the gold atom to attract electrons. 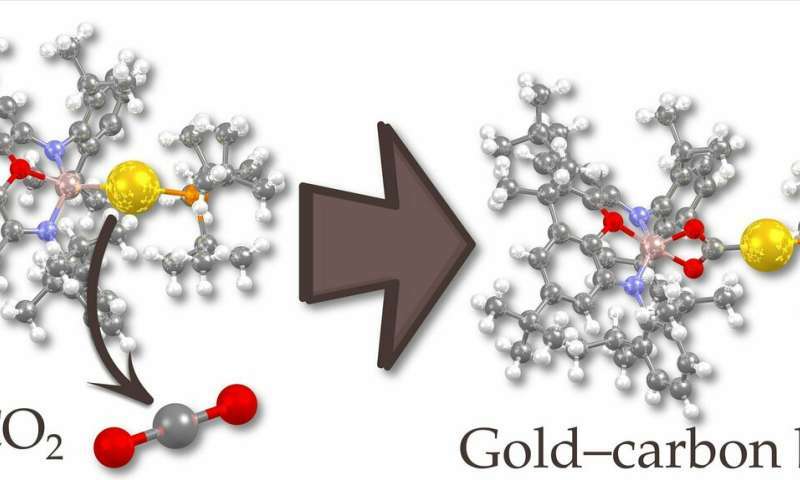 "This transfer of electron-rich character from aluminium to gold is highlighted by the reactivity of the complex: a reaction between the compound and carbon dioxide results in a product where the gold atom has attacked the central carbon atom," explains postdoctoral researcher Petra Vasko from University of Jyväskylä. Gold complexes are well-known to be powerful electrophiles in many useful catalytic transformations. In addition, text-book transition metal reactivity (oxidative addition, migratory insertion, etc.) has only started to be developed for gold. "Nucleophilic behaviour has been virtually non-existent prior to this work. Hence, these results can open up a completely new facet in gold chemistry," says postdoctoral researcher Akseli Mansikkamäki from University of Jyväskylä.